There is a question that’s my floating around my head lately, and indeed, a lot of people’s heads lately, be they euro-skeptics at polling stations up and down the country in recent elections, or Scots weighing up the arguments for and against independence as decision day fast approaches. The question is, who, exactly, are the British? A few weeks back I learned that a lot of us, at least, are a little bit Viking. A few months earlier I discovered that the British way of life was invented by the Georgians, starting three hundred years ago. With a royal family that has been successively French, Scottish, Dutch and German over the past thousand years, a Germanic language, a commonwealth of former colonies that span the entire globe and a society growing ever-more multicultural by the decade, it does not matter whether one peers back into the mists of time, or focuses very much on the present day, defining the British, and working out where they came from, is far from straightforward. The Natural History Museum, with their latest exhibition, go back further in time than surely anyone has ever gone before to try to shed some light on the matter. Britain: One Million Years of the Human Story tells the story of how Britain first became populated with humans, who these first settlers were, and how they lived. Forget Normans, Vikings, Angles, Saxons, Romans and Celts – here we are going to meet the very first Britons. The men and women who first called this rainy little island home. Whatever an exhibition’s subject matter, I am always impressed when it is able to link past and present together in an immediate, effective fashion, and this exhibition gets underway with a perfect example of this. It was only last year, on the shores of Norfolk, that a set of what are believed to be the oldest human footprints ever discovered outside of Africa – about 900,000 years old – were revealed after a storm had washed away much of the beach, and it is a cast of these prints that starts us on our way along a chronological journey through Britain’s prehistory. If the Natural History Museum already had an exhibition about Britain’s first humans in the pipeline when this discovery was made, which seems pretty likely, then this discovery constitutes a tremendous stroke of luck. There surely could not have been a better way to kick off an exhibition like this that with something that is simultaneously the oldest evidence of humans in Britain, and the newest significant archeological find. The footprints, discovered in a place called Happisburgh, may be ‘human’, but they were not made by the same species as us. We – as in, Homo Sapiens – did not show up in Britain until relatively recently, about 40,000 years ago. The oldest human fossils ever discovered in Britain are of an ancestor of homo sapiens called Homo Heidelbergensis, which are around 500,000 years old. 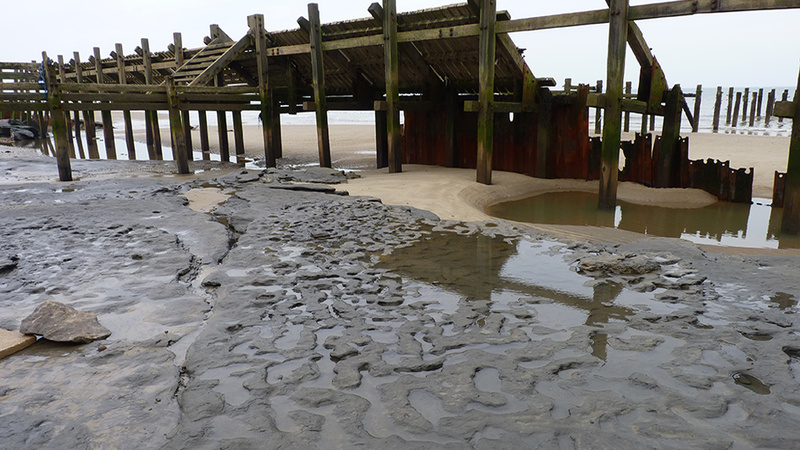 With the footprints at Happisburgh nearly twice as old as that, it appears that for the very first time there is evidence to suggest that an even older ancestor of ours, Homo Antecessor – fossils of which have been found elsewhere of Europe, dating to about the same time as the footprints – once walked on British soil. 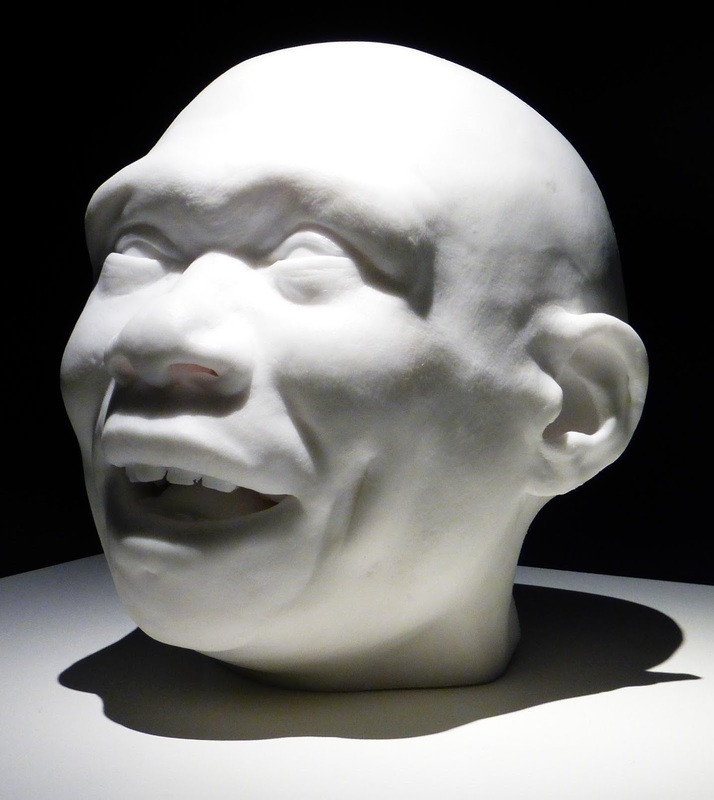 There is a cast of a head of a homo antecessor displayed alongside its three descendents, the aforementioned homo heidelbergensis and homo sapiens, and that other key player in the story of early humans, Homo Neanderthalensis (neanderthals). Of the four, homo antecessor has the smallest head, and I reckon looks by far the most friendly. The exhibition proceeds as a series of rooms, each jumping forward a few thousand years, and to a different part of Britain (the shape of which was constantly changing as sea levels rose and fell, ice sheets advanced and retreated, and rivers shifted course – as illustrated by an animated map in the exhibition and this slideshow). Each room’s era, and location, represent an archeological discovery of special significance. So after seeing homo antecessor’s footprints on the shore at Happisburgh 900,000 years ago, we move to Boxgrave in West Sussex, jumping forward to 500,000 years ago in the process, and meet homo heidelbergensis – or rather, a bone from the upper leg of one of them. Being the oldest human fossil ever found in Britain, the half-million-year-old Boxgrave tibia is a very special artefact indeed, and it is amazing to look at a piece of a person that lived such a ridiculously (to my historical brain, at least!) long time ago. In the same room are some amazing close-up images of some teeth found at Boxgrave that show tiny cut marks made with pieces of flint, that suggest that homo heidelbergensis would use a small piece of flint to hack at meat while it was in the process of chewing it. Though I was a little surprised and disappointed, after seeing these incredible images, not to see the actual teeth displayed alongside. Too fragile for public display, perhaps? This brings me nicely onto a point that occurred to me only after I had left this exhibition, which is that overall, there is not actually that much on display here in terms of human remains, or indeed human tools, and most of those look the same as each other anyway (at least until the ingenious and inventive homo sapiens came along!). With such precious few human fragments in Britain to begin with, was an exhibition all about early British humans really worth putting on in the first place, I wondered. Could the most interesting bits of the exhibition, the videos, have simply been cobbled together and made into a good television documentary, rather than being crafted into a visitor experience? Is the large number of stuffed animals and animal bones, nearly all of which could have just as easily been seen in a cabinet in another room of the Natural History museum, a reflection of how little the curators had to work with? In my opinion, what ‘One Million Years’ really hinges on are the full-size reconstructions of a homo sapiens and a neanderthal in the final room. Being able to stand next to them, look into their eyes, and walk around them, allows you to really imagine them, living and breathing in a way that a television documentary simply could not. I especially liked the fact that the neanderthal man stood in a very upright posture and wore a very thoughtful expression, as opposed to the standard about-to-throw-a-spear-at-a-mammoth pose that I have grown used to seeing neanderthals depicted in. And with homo sapiens only a few feet away, the effect is to make the visitor stop and take the time to compare them, spotting their similarities as well as their differences. They are what bring this whole exhibition together, and make it well worth the visit. The curators deserve credit for how the exhibition has been laid out as well. It may feel like there are far more animals than humans, but they do serve to create atmosphere. I must admit I had absolutely no idea that Britain was inhabited by lions, rhinos and hyenas at the same time as humans. The sequential, timeline format of the exhibition was also very good at stressing just how changeable the climate of Britain has been over the past million years, and how this led not to a steady stream of human settlement, but instead several separate periods of settlement. These periods of settlement – of which there were believed to be nine in total, before one final, tenth attempt at colonisation was successful, starting about 12,000 years ago – were sandwiched in between severe ice ages (when it was too cold to live as far north as Britain) and warmer periods (when sea level was high enough to cut Britain off from mainland Europe, and make reaching Britain impossible, since these early humans did not have boats). Towards the end of the exhibition, in the room where we first meet our homo sapiens and our neanderthal, we begin to see the differences between these two human species, that from around about 40,000 years ago both co-existed in Britain. Neanderthals had lived, on-and-off, in Britain for more than half a million years by this point, and yet within a few thousand years of first encountering homo sapiens, they had disappeared. No one is sure exactly why, though it is very clear, as demonstrated by some of the objects on display in the exhibition, that homo sapiens had better weaponry when it came to hunting. Their flint blades look nothing like those made by the neanderthals, far longer, sharper and streamlined. There are also animal antlers on display, which homo sapiens adapted and put on the heads of their spears, so that they could both pierce the skin of an animal and lodge deep into their flesh. And it was not just homo sapiens’ weaponry that gave them a competitive advantage over their neanderthal cousins, who no doubt would have been hunting the same animals for food. As demonstrated by the life-size reconstructions, homo sapiens stood much taller, and was less stocky, than the neanderthal. They were the marathon runners to the neanderthals’ sprinters, which meant they could pursue their prey over longer distances. Whether or not competition between the two species for food was fierce enough that these two human species began killing each other, or even hunted each other for food – in other words, whether neanderthals were literally wiped out by homo sapiens – is not known. But there is a rather chilling artefact that appears to show that the practise of cannibalism even within the homo sapiens species was occuring as recently as 14,700 years ago: a human skull, from within which all fatty brain matter has been carefully scraped out, before being sculpted to form a bowl for drinking. As it happens, homo neanderthalis never quite dissappeared for good. In fact, they walk amoung us to this day, sort of. They live in our very genes, in our DNA, in every cell in our bodies. The exhibition’s closing video features a few well-known faces – Bill Bailey, Clive Anderson, and Dr Alice Roberts, amoung others – talking about their genetic heritage, as determined by a study of their DNA. From just a tiny swab from the inside of a person’s cheek, scientists can now discover from which wave of early-human migration that a person’s paternal and maternal lineage stem from. They can also tell you what percentage of you is neanderthal. Research suggests the average non-African person’s DNA is about 2.5% neanderthal, which means however hostile the relatioshnip between them and homo sapiens was when the species encountered one another, at least some inter-breeding did take place. It raises all kinds of possabilities, and throws up many intriguing questions for today’s geneticists, such as whether or not homo sapiens have ultimately benefited from having the continued genetic legacy of the neanderthal in their DNA. Future study should shed more light into whether certain hereditary illnesses or conditions are part of that legacy, or whether in fact many more conditions have been prevented from being handed down to us, and our immune systems made stronger, precisely because of it. I for one am absolutely fascinated to see what our genes will be able to tell us about our origins in the years to come. Perhaps, eventually, the day will come when we will look not to our politicians, or even our historians, but to our scientists, to answer those age-old questions: who am I, and where do I come from? 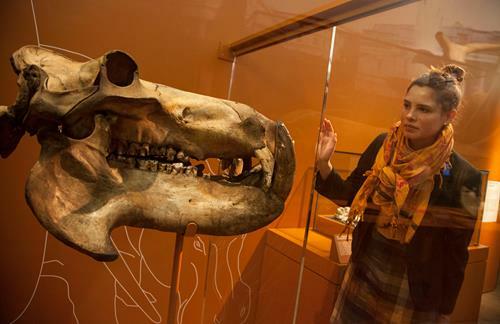 Britain: One Million Years of the Human Story runs at the Natural History Museum until 28th September 2014. Tickets cost £9 for adults and £4.50 for children (there were lots of children when I visited, and they all seemed to be loving it!). Book here. Tags: Alice Roberts, archeology, Bill Bailey, Boxgrave, Britain, Britain One Million Years Review, Clive Anderson, colonisation, DNA, exhibition reviews london, exhibitions london, flint, fossil, genetics, Georgians, Happisburgh, Homo Antecessor, Homo Heidelbergensis, Homo Neanderthalensis, homo sapiens, human, ice age, language, Natural History Museum, neanderthal, Norfolk, One Million Years of the Human Story review, Roman, science, scientist. Bookmark the permalink. Very interesting information and very well written piece! I’ve been wanting to see this exhibit, and you’ve made me want to see it all the more. And I appreciate your linking it to the whole (and I think phony) issue of Britishness. Thanks. Funny thing isn’t it. No matter how far back you go, it’s a nation of immigrants all the way!